Situated in the interior of the territory comprised between Gela and Piazza Armerina, Caltagirone rises up on the slopes of the Erei hills in a panoramic position. Due to its strategic valence of control over the plains of Gela and Catania, its territory was inhibited since the Neolithic era and for the whole of the Bronze age until the arrival of the Greek colonies, as testified by the recovery of habitations in the Sant’Ippolito quarter. Little is known about the Greek and Roman periods, and it wasn’t until the arrival of the Arabs that history mentions the Fort of Cal'at Ghiran. The same Castle was then taken by the Byzantine Maniace and then by the Normans in 1090, under which the city saw a period of development, also thanks to the ceramic industry. A terrible earthquake interrupted this development in 1693, destroying a huge part of the Sicilian city. 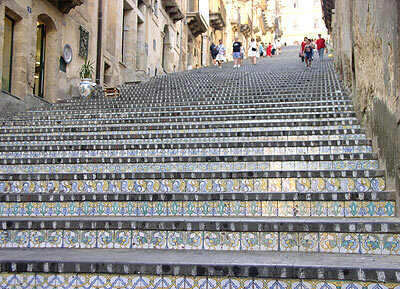 The reconstruction of Caltagirone came about in the successive century, giving the City its actual Baroque appearance. A visit to the City passes by the Duomo of S. Giuliano, a Norman building which was reconstructed in the 17th century, in order to reach the Piazza del Municipio (Municipal Square) where you can find the Palazzo Senatorio (15th century). There are many churches in the City, amongst which those of the Cappuccini, of Salvatore and S. Maria del Monte. Caltagirone also offers important visits to museums: the Museo Regionale della Ceramica (Regional Museum of Ceramics), Villa Patti which hosts the Museum of Historic Villas and the Civic Museum, positioned on the second floor of the ex Carcere Borbonico (prison, 1782).